Overnight into the Ukrainian Independence Day, 24 August, an environmental disaster occurred in the North-Crimean city of Armiansk, home to about 22,000 people, lying near the administrative border to mainland Ukraine’s Kherson Oblast. The local residents told on social media that they had smelled an acidic odor. They described a greasy “rust-like” substance, similar to old engine oil, which coated plants and houses, and made metal items go rusty outdoors and indoors. People started experiencing eye, throat, and skin irritations. Later reports came on pets having started to suffer and sometimes die. The Crimeans suspected that an unknown substance was spewed into the air by the nearby “Crimean Titan” plant, which produces concentrated sulfuric acid and uses it to dissolve titanium dioxide from ilmenite, the titanium ore. The occupation authorities evacuated children from Armiansk only two weeks after the incident and blamed Ukraine for the disaster, referring to the plant belonging to Yanukovych-era fugitive oligarch Dmytro Firtash as Ukrainian, and alleging that the lack of water in the North-Crimean Canal caused the emission. Ukraine had halted water supply to Crimea back in 2014 shortly after Russia had annexed the peninsula. We tried to find out what could cause the air pollution. In the early hours of August 24, an unknown chemical substance leaked into the air in the north of Russian-occupied Crimea, according to social media reports by local residents. Local residents told that their house keys, radiator grilles in cars, construction tools stored on balconies, and other metal items suddenly rusted. “It’s a disaster. The occupiers are silent. Everything is in rust – both outdoors and indoors. The pavement in the town is ‘greasy.’ Equipment is out of order. People feel bad, have allergic reactions. It has been continuing for several days,” wrote a Crimean blogger summarizing local reports on social media. On August 30, Crimean environmentalists and experts concluded that evaporation of acid at the Titan Plant could cause the environmental disaster due to abnormal heat and the absence of water in the North Crimean Canal. On August 28 the head of the occupation administration, Sergey Aksyonov acknowledged that unknown emissions were released into the atmosphere but he claimed that they were not the result of an accident at the “Crimean Titan” plant. That same day Russian President’s special representative for environmental issues Sergei Ivanov suddenly appeared in Crimea. Upon his arrival, Aksyonov admitted that “Crimean Titan” could be responsible for the emissions, Aksyonov also first claimed the emissions did not pose a health hazard, but later called them harmful. On 3 September, Ukraine’s Border Service spokesman Oleh Slobodian reported that the servicemen of the Kherson Border Detachment detected the excess of the “toxic industrial substances” in the air. Overnight into 4 September, another release of unknown chemicals occurred. On 4 September occupation authorities evacuated about 4,000 children from Armiansk, the plant shut down for two weeks, however, its last of the eight stoves was stopped only on 9 September. Ukrainian Ombudsperson’s representative for Crimea Ismail Khalikov said that information on the disaster was submitted to the UN, OSCE, Who, and the Red Cross Organization. 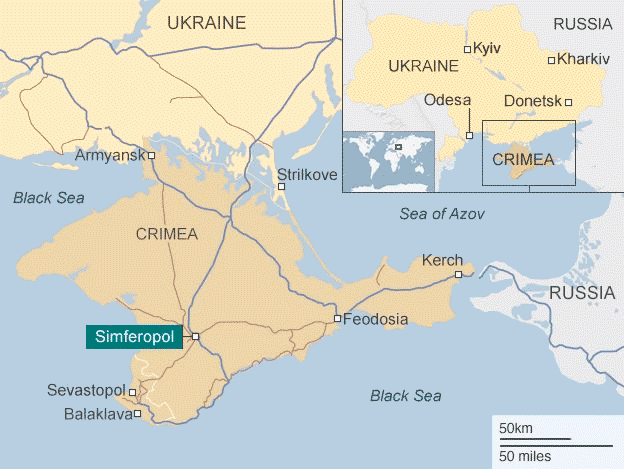 Ukrainian minister of occupied territories and IDPs Vadym Chernysh said that border guards detected sulfur dioxide in the air in the areas of Kherson Oblast adjacent to the occupied Crimea, but the safe limits were not exceeded. On 7 September, head of Crimean occupation authorities Sergey Aksyonov following an action meeting in Armyansk told that the acid tailings pond should be filled with water by the next summer, since Ukraine isn’t going to supply fresh water, the Crimean “authorities” are going to fill it with salty seawater from the Black Sea fed via a projected 10-kilometer pipeline. This decision can make the disaster permanent since salty water can react with the sulfuric acid in the pond generating the volatile hydrogen chloride. 61 Ukrainian border guards deployed in the areas near Crimea sought medical care following the disaster, five of them were brought to the hospital as of 8 September. As of 10 September, 59 people fled to mainland Ukraine following acid leaks in Crimea, according to Ukraine’s Border Service. On 13 September another “acid leak” reportedly hit the town of Armiansk. On the next day Natalia Penkovskaya, the so-called “head” of the regional department of Russia’s consumer rights watchdog Rospotrebnadzor, said that the excess of the maximum safe concentrations of harmful hydrogen chloride (HCl) and sulfuric anhydride (SO3) in the air were once again recorded in Northern Crimea. However, Penkovskaya said there was no threat to the health of local residents. On 15 September, the Ukrainian checkpoints Chaplynka and Kalanchak resumed operations. On 17 September, CEO of JSC “Titan Investment” Andrey Akulov said that the dam dividing the acid effluent pond and the Sivash Saline “is partly ruined in the Ukrainian territory” [Russia claims Crimea to be a part of Russia, one half of the dam is located in Kherson Oblast, another in Crimea – YZ]. According to him, it was spotted on Friday, 14 September. Head of occupation administration of Crimea Sergey Aksyonov said that “Crimean Titan” plant can be “nationalized” if its owners won’t eliminate the consequences of the chemical emissions, Radio Liberty reported on 18 September. As of 20 September, Ukraine evacuated 548 children from the Kherson villages near the Crimean administrative border. According to Russia’s Uniform State Register of Legal Entities, JSC “Titanium Investments” (Moscow) belongs to Letan Investments Ltd (Cyprus), which is also a founder of Group DF International GmbH (Austria), a holding company by fugitive Ukrainian oligarch Dmytro Firtash. Titanium Investments was registered in June 2014 to legalize its work in occupied Crimea: Firtash transferred the Crimean Titan plant to a long-term lease for Titanium Investments following the annexation of the peninsula. “Crimean Titan” itself was re-registered in Kyiv as “Ukrainian Chemical Products” in 2015. In 2017, the Russian bank VTB filed an action with a court to recognize Titanium Investments bankrupt and last February the court instituted an initial bankruptcy procedure. However, the plant never suspended production since the beginning of the occupation. at the sulfuric acid production facility, technological gas leaked from a kiln. Both incidents were reportedly not investigated or even registered by the personnel. Two production facilities with flaws in their integrity were involved in the production processes. The information sheet reveals that in the first half of 2016, 25 safety violations were discovered and 18 more in the second half, two inspections in the first half of 2017 revealed 48 violations. The enterprise was fined following each inspection and continued operations. The sheet also describes an incident on 9 August 2018, when loadbearing structures of the roof collapsed in one of the plant’s shops. On 10 September, “Crimean Titan” stopped production and was fined it $11 mln for polluting the environment. Back in June 2016, it was fined $6000 for industrial safety violation following an inspection. Also, a Rospotrebnaszor’s document available on the web describes the above mentioned incident on 9 August 2017 when the shop’s roof collapsed. What could cause the disaster at “Krymsky Titan”? The locals suspected that the toxic gas, sulfur dioxide, could leak into the atmosphere, since it is the main feedstock in the so-called contact process, a method of producing sulfuric acid in the high concentrations suitable for industrial processes. According to another local version, the factory’s effluent pond of sulfur waste dried out, the wind raised salts of sulfuric acid and toxic dust into the humid air and brought them to the nearby settlements. “The sulfur trioxide (SO3) forms sulfur fog, a phenomenon that is commonly referred to as acid fog. It is this acid fog that the locals saw, felt soreness in their throat, pain in the eyes and [other] unpleasant sensations,” Crimean ecologist Marharyta Lytvynenko assumed in an interview with Hromadske. At the 6 September meeting of the National Security and Defense Committee, Ukrainian President Petro Poroshenko said that the ecological disaster in Crimea could be caused by the training of Russian soldiers, which destroyed “environmental protective mechanisms,” a day before the Ukrainian Military Intelligence voiced this version, referring to the Russian drills on 13-19 August when the Russian units conducted live firing exercises near the waste settling ponds of titanium and baking soda plants. “For three years, hydrolytic acid has been drained into settling reservoirs in full violation of technology,” ex-worker of Crimean Titan plant, Oleksandr Ivashchenko, said in an interview with TSN. “Water is not the main factor,” he added. “No amount of water is able to dissolve those volumes of acid to a neutral level.” Another former worker, Mykola Kuratnyk, claims the plant gave up on using filtering systems which earlier ensured operational safety. Excessed sulfur dioxide (SO2) and trioxide (SO3) emission as a misoperation of a North-Crimean plant – “Crimean Titan,” Crimean Soda Plant, or Crimea Bromine Plant. Damage of tailings reservoirs at the mentioned plants caused by Russian military drills. An intended emission conducted by Russia to create a massive information campaign against Ukraine to destabilize the situation in the south of Ukraine. “When affected by concentrated sulfuric acid (H2SO4), brine or dry salt of chlorides can produce hydrogen chloride (HCl). This gas is light enough to dissolve in the clouds and fog. Meanwhile, sulfur trioxide (SO3) is much heavier, thus it spreads in the air with greater difficulty. Also, the chemical processes involving sulfuric acid produce not that much of it as of sulfur dioxide (SO2), smelling like a match being lighted [what is known as the “sulfuric smell,” and Armiansk townsmen didn’t mention it describing their experience – YZ]. Sulfur dioxide is less aggressive than hydrogen chloride,” says the chemist. 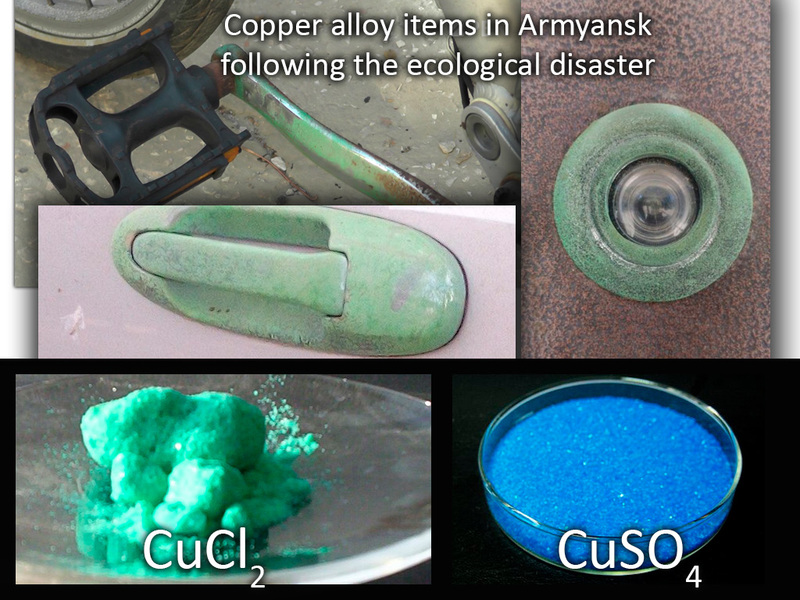 “The copper alloys turned greenish are rather indicative of copper chloride (CuCl2), the reported rust-like thick slime [fell as a dew in Armyansk] is possible in case of sulfates involved, but their concentration might be very high which is unrealistic. And it plays well in favor of the increasing concentration of hydrogen chloride,” explained Dr. Khalavka. 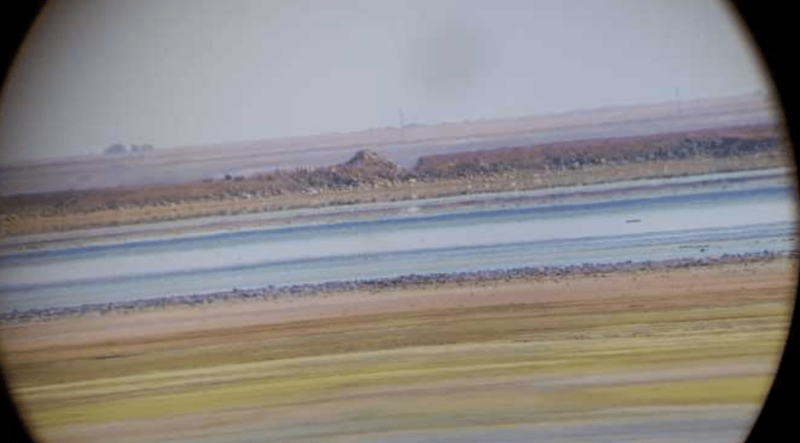 So we can see that the disaster could be caused by an attempt to fill the dried-out effluent pond with salty water from Sivash. The dam could be damaged by the “Crimean Titan” personnel or by the Russian military as Ukraine stated. Whether the disaster was made intentionally or it was an accident, Russia has once again tried to use the incident attempting to make Ukraine restore water supplies from the Dnipro River to the North-Crimean Canal.